Share the results with your colleagues, securely. Usually, when you want to share data, you send over the actual data files to your colleagues. With DataRow, you can instead send a link that directs your recipients to the work you’re sharing. You create the data, tell DataRow to create a hyperlink, and forward the hyperlink to your colleagues. 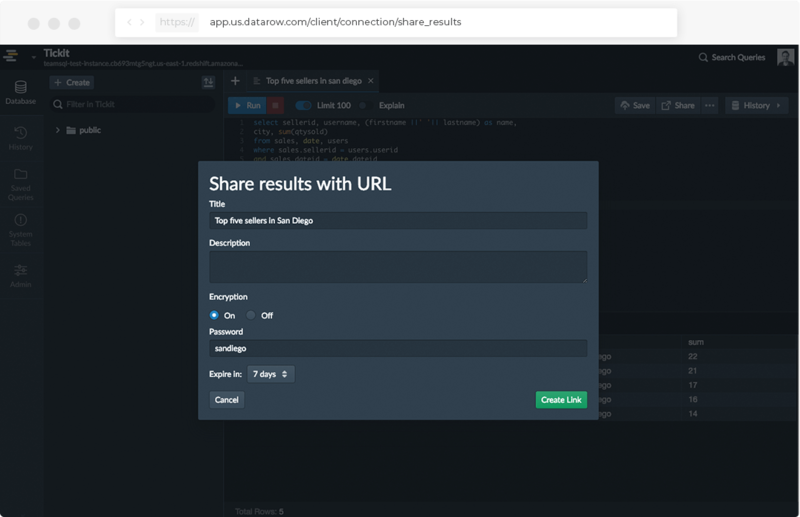 With DataRow sharing, your colleagues can then access the data from any internet-connected browser. You can also secure your data to ensure that only those with the link and the password can see your data. When it comes to sharing, we know how your data is valuable, so we’ve taken steps to help you ensure that it doesn’t fall into the wrong hands. You can choose to leave your data unencrypted, but if you do decide that encryption is vital for you, you can opt for this — DataRow utilizes AES-256 encryption to help keep your work safe. We designed and developed DataRow to make sure your data is secure and confidential. Data security is a critical responsibility we have to our customers, and we work hard to maintain that trust. Visit our security page to learn more.